This was a baby quilt for a friend who had her shower today. 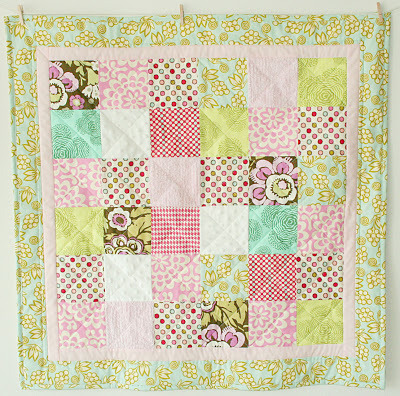 I love making baby quilts for babies that I know I’ll get to see and hold lots and lots! The back of this is that super soft chenille minky, I love that stuff. I did notice more stretching with it that the minky dot, but its well worth it since it is SO much softer! I think I finally used the last of my Sandi Henderson ginger blossom breeze dots, so maybe now I’ll have to find a new cute baby girl fabric with blue and green in it. But its been my favorite go-to fabric for baby girls! I should probably buy some more of it huh? yes…I should. Saturday we are off to Mexico for a much needed break from this Cleveland weather. I haven’t even started packing, today I was brave enough to try on my swimsuits though….yuck. I’m hoping a nice thick coat of self tanner (or six) will hide my I-LOVE-ICE-CREAM thighs. Not likely. :) I’m counting on a long list of fun blog posts to read when I get back (if I come back!) so get busy crafting! I so need a warm weather vacation right about now. I wasn’t sure how traveling with Brice would be, but after seeing you’ve already been to Mexico with your little one, I thought: I could do that! But it will have to wait a little while. Have a great time! Oh yeah – love the quilt! Oh, it was SOOOO cute! 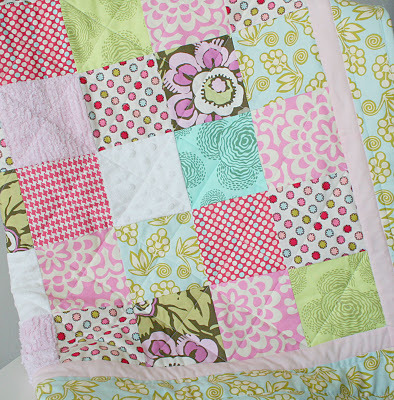 What a lucky baby girl to get such a beautiful quilt! Thanks for all your help. I super jealous about your trip. I need to get away from this cold place! you’re going to love the summers though…they are a dream. How sweet! I agree with you about that border fabric – love it! I think I might have a small amount in my stash, so now I’m inspired to use it! Have a wonderful trip!!! I found your blog through a post you made on someone else’s blog, and I’m so glad I did! I really like your style! I look forward to visiting again! This is adorable! I usually make bibs, burp cloths and fun little comfort lovies for baby showers but this is a beautiful way to use up all the little scraps I have laying around! Gorgeous fabrics and I’m sure baby girl will love it for years to come. Hi from Sydney, Australia. Your work is gorgeous. I found you via Chickpea Sewing Studio and will be visiting often!